JOEL Smith's father Shaun took what many consider to be the mark of the century against Brisbane at the Gabba in 1995. Joel was less than one year off being born when his dad soared over Bears opponent Richard Champion and hauled in a grab that has become one of the most iconic moments in AFL history. Now 22 and going into the fourth season of his career at Melbourne after forgoing a promising basketball career, Joel has similar high-flying attributes to his dad and perhaps the confidence, too. "Dad always gives me a bit of banter after I drop one (an attempted speccy), but hopefully one day I can take a fairly decent one and try to shut him up a little bit," Smith told AFL.com.au. A shift to the forward line in 2019 may give Smith more of an opportunity to defy gravity a little more often. "That's the thing about playing forward you can actually go for your marks instead of trying to spoil it. Hopefully I can get the right kick and the right sit and get up there and hold a couple this year," Smith said. Smith's projected move into attack came about following a conversation with coach Simon Goodwin at the end of the season about how best he would fit into the team in 2019. 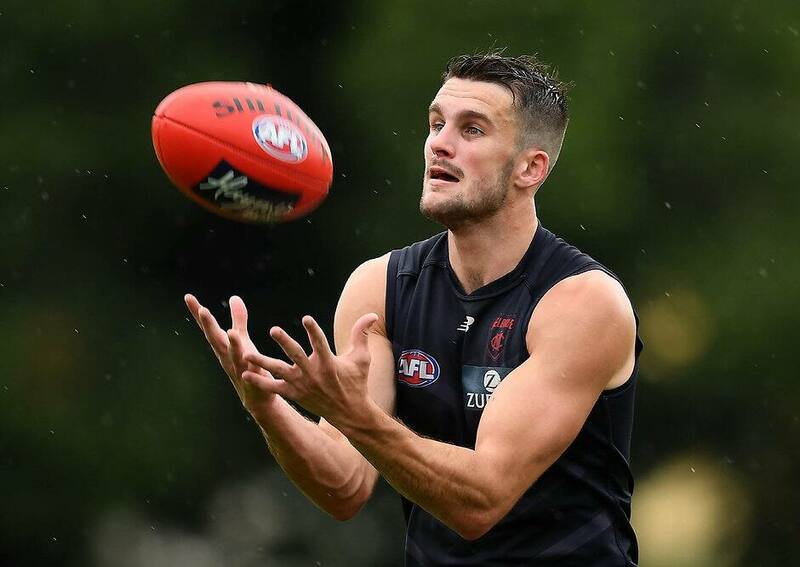 Smith has been one of Melbourne's standout pre-season performers and has spent the summer training alongside Tom McDonald and Sam Weideman and at 191cm and 88kg he projects as a valuable third tall option given his marking prowess and his agility when the ball hits the ground. Goodwin explained that reasoning to Smith. "It was more about my strengths with my speed and athleticism and being able to put them on show a little bit more," Smith said. For all the promise – and there has been plenty – Smith has shown in his time at Melbourne, the athletic youngster has managed just 11 games in his four seasons. Smith's unlucky injury run began in his debut game when he dislocated his left shoulder when tackled by Saint Nick Riewoldt in the first 15 minutes of his debut. Later in the year, while playing in the VFL, he suffered a season-ending broken tibia. Jake Lever's arrival at the start of last season meant opportunities were limited in Melbourne's backline, but when the star recruit went down with a torn anterior cruciate ligament in June, Goodwin turned to the versatile Smith to fill the void. After playing six of the next seven games and re-establishing himself back into the side, Smith broke his right collarbone in the final quarter against Gold Coast in round 20 putting his finals hopes in jeopardy. "I asked 'Z' (club doctor Zeeshan Arain) when I was down in the rooms how long I'd be out for and he told me straight away that I'd get back in three weeks," Smith said. "I said to myself straight away that I'll be back for the finals so that was a pretty big motivator for me to get back." Smith did everything in his power to recover properly and then put himself in the frame for a return in the Demons' preliminary final clash with West Coast in Perth. He replaced the unlucky Bayley Fritsch in the Demons' side and despite the demoralising 66-point loss he lapped up the experience. "It was a proud moment for myself but we took a lot of learnings away from that," Smith said. "You can get thrown off by crowd, but what stood out for me was the importance settling down, trusting in the system and staying calm in the moment. "Hopefully we can draw on that experience and we're better for it this season."